Since the first observation of a hurricane with sustained winds faster than 250 km/h, in 1928, there were only four storm seasons that began with a Category 5 hurricane (1958, 1977, 1980, and 1992). Until 2007, that is. Dean made landfall three weeks ago, August 21. It was the first hurricane of the year and the first to max out the Saffir-Simpson scale since Wilma 2005. Wilma, incidentally, scored a record of her own two years ago, with a pressure of 882 mbar near Cuba (10/19/05), the lowest ever measured in the Atlantic, and noticeable in Tampa. See Monica 2005, Wilma 2006. Hurricane Felix made landfall September 4. Felix is this year's winner of 3 (yes, three) climate records. The second hurricane of the year was also a Category 5 hurricane. Multiple C 5 storms had formed three times in the Atlantic since measurements started (1960, 1961, & 2005), but never before did any season kick off with two C 5's in a row. That's unprecedented--and a new record. Felix's second climate record is the speed by which it spun up from a depression to a Category 5: a mere 51 hours, quicker than any storm on record ever. Three's the charm, and Felix wins the blue ribbon by being the first hurricane ever observed making landfall at the same time as another hurricane, with Henriette in the Pacific. Thank you George Bush! Speaking of the climate changer in chief: on September 7, he had a bad day at the APEC meeting in Australia. With his blood-for-oil mind, he thanked his hosts for inviting him to the OPEC meeting and praised the valor of the Austrian army killing people in Iraq. And that is the leader of the U.S., unimpeached and out of jail, six years after 9-11. Go figure. The climate changer in chief and his downunder crony released a declaration on climate change (pdf) that states "aspirational" goals. There are an "aspirational global emissions reduction goal" (p. 2), an "aspirational goal of a reduction in energy intensity" (p. 3 and 4), an "aspirational goal of increasing forest cover" (p. 3 and 4), and last but not least "this aspirational goal" (p. 4). I hadn't even heard of the term before coming across this declaration. Basically, it means that they "aspire" to think about getting ready to consider a goal. What goal? Beats me. Something to do with planting trees, using less power, and making less of a stink. As they put it: "we agree to work to achieve a common understanding on a long-term aspirational global emissions reduction goal to pave the way". Great! How about signing on to Kyoto instead, eh? The pompous nonsense was condemned here and here. The clock's ticking. Just tonight news came in that we've reached the first tipping point. So James Lovelock is right after all. Thank you George Bush! 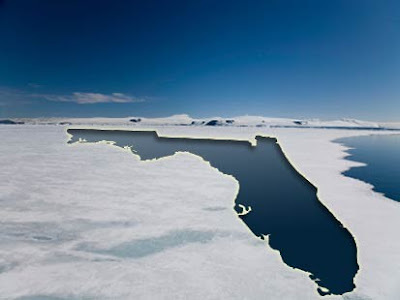 This is it: arctic ice the size of Florida gone in six days. So. Put yourself in space and look at the planet from afar. Guess what happens to ocean temperature in the sunshine when white ice turns into black water. After we had to learn what the climate changer in chief means with "aspirational," now it's time to study up on the meaning of "albedo". And "feedback loop."